Would it sound crazy to say underwear was the inspiration for this? A few years ago I'd bought a cute pair of briefs for my oldest son that had mom tattoo hearts all over them. They were adorable, but for obvious reasons (like wearing pants) no one saw them. Unseen cute is a sad thing. This blank sweatshirt has been laying around waiting for a project for almost a year, so when I saw them both again, this was the ideal solution. 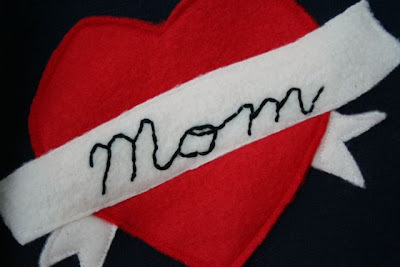 Once again my scrap bin provided the fleece to make the heart & scroll. I sketched out the shapes on paper & then cut them out of fabric. 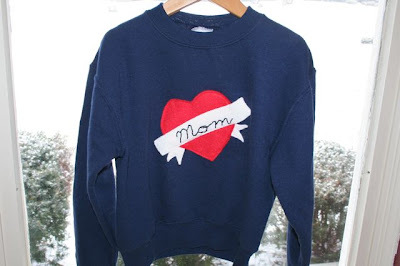 I hand embroidered "Mom" with a backstitch and then sewed the pieces onto the shirt. Since they're fleece, no worries about fraying. I also love that it's very Valentine's, but can also be worn long after the holiday. Why not remind the little guy who his favorite lady is? Very cute! Looks a bit like a cool tattoo! Thanks again for joining Get your craft on thurs."